Purpose built waterfront property, with beautiful views, set on a peaceful lagoon with private boat ramp. 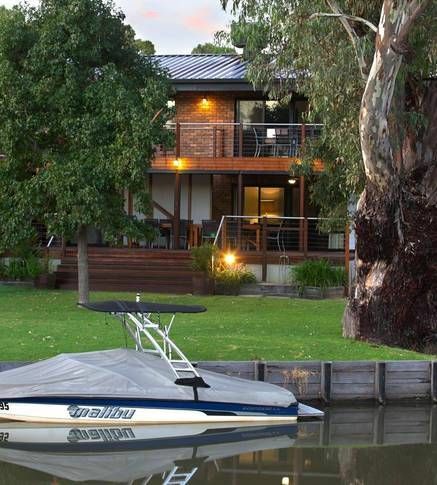 Direct access to the Ovens and Murray Rivers for the watersport and fishing enthusiasts. Or come and just enjoy the relaxing setting with family and friends. Within walking distance (2km) to the family friendly Bundalong Tavern. Opposite the Tavern is the Licensed General Store, which supplies groceries, take away, fuel and ice. 10 minute drive to Yarrawonga which has major supermarkets, bakeries, cafes/restaurants as well as the golf, bowls and waterski clubs, which all offer drinks, meals and entertainment. 15-20 minute drive to the Rutherglen wine region, which offers many great wineries, as well as cafes, hotels and fine dining. Bus companies can pick you up from the house for full or half day tours. Just under 3 hours drive from Melbourne. Reverse cycle airconditioning, fans and heating throughout. Situated directly on the lagoon where you can swim, fish, canoe or tie up the boat. The house is set on a large block with plenty of undercover secure parking for vehicles and or boat. (All beds have mattress protectors only). All bookings commence at 2pm and finish at 10am. Later checkouts are available free of charge if there is no other booking that same day or the next day. Deposit: A non-refundable deposit of $600 is required to secure your booking. Bond: A bond of $600 is required for all bookings. The bond will be returned within 5 days of the last night's stay. Any damage or breakages, accidental or malicious along with any items missing from the property will be paid for by the renter. House not to be booked for bucks/hens type parties. If the house or property requires more than reasonable cleaning, an additional cleaning fee will be deducted from the bond (at a rate of $50 per additional hour of cleaning). At no stage is there to be anymore than the maximum number of 14 adults staying overnight at the residence or on the property unless prior arrangements are made. If this is found to be the case the entire bond will be forfeited. Unless prior consent is given we DO NOT allow tents to be errected or caravans on the property. Strictly NO PETS allowed. Great location and very comfortable...everything you need. If you are skiing, fishing or relaxing on the lawn in the shade it made our stay very enjoyable and the boat ramp less than a stroll away with a mooring at the house made life very easy. Great spot and a great weekend!- Thanks Carolyn! We all had such a great time such a great place for a holiday we also fell in love with Bundalong. Everything about this house was exactly as it was advertised. New T.V. was installed on the 2nd Last day of our trip, but it didn't matter we had the best time on the deck, we also took a biscuit for my brothers small boat. We want to get the Grandkids used to the river . had a lunch cruise as well fantastic trip. Thank you Carolyn we just loved it. A great weekend enjoyed by all in peaceful, relaxing surroundings. We spent most of our time out on the deck which catered for all our needs. Plenty of room for a large number of people. I would definitely come again. This is the perfect house for several couples and even the kids too. The private boat ramp is only meters away and we had or boat moored directly out the back door!